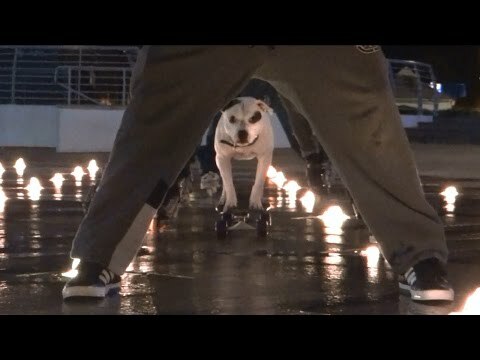 Essentially the four-legged version of Tony Hawk, Ziggy Trixx the Staffordshire bull terrier could very well be the best skateboarding dog in the world. Hailing from the UK, the talented K-9 has created quite the name for himself by learning not only how to skateboard better than most people, but also to propel himself forward using just a single hind leg. As the video above shows, he's also learned how to navigate through tunnels, (or in this case, eight people's legs) proving that balance for this pup is no sweat. Ziggy's owner claims that he's attempting to improve the breed's image with his tricks -- a talent that he started his puppy on at the age of 8 months old.